First, a little story. This weekend I spent part of my time looking at universities. We have two fairly local to us and I have a close relative who is hoping to start a degree next year, so I offered to take her to them. However, I didn’t want to influence her too much with my opinions so let her do the tours with a friend as I entertained myself. Well, for me, entertainment was a student bookshop, where they sold the Penguin Little Black Classics – a collection of books that have probably been out of print for a very long time, mostly short and really cheap. In this particular example it was 80p (with a 10% discount on top of that!). To put that in context for overseas readers, last week’s read would cost £8.99 new, so it’s very cheap indeed. Naturally, I bought a few. I limited myself to four, which I am extremely proud of, and started reading one straight away. 2 pages in it was saying that at a certain age people shouldn’t go out in public, and I knew I was onto a winner! 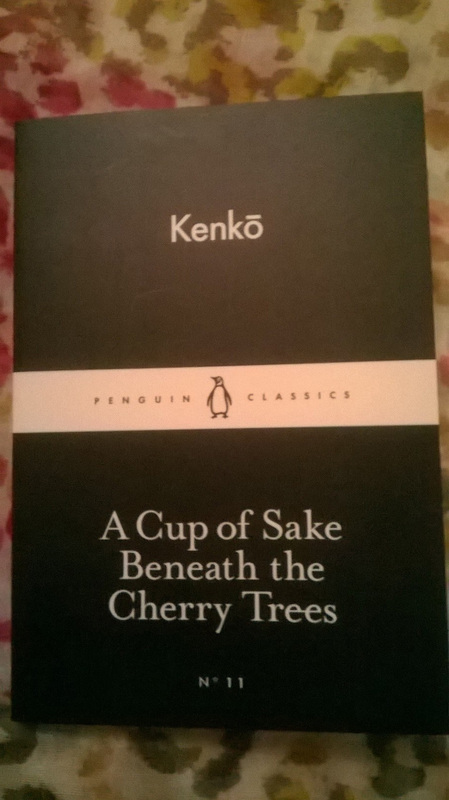 Book 41 – A Cup of Sake Beneath the Cherry Trees, by Kenkō; translated by Meredith McKinney. This isn’t a novel, so much as a set of thoughts about the world, so a review in the normal sense doesn’t really work here. Kenkō was a Japanese monk who was born in the late 13th century. His thoughts obviously reflect a different time and place to that in which I live and a lot of what he says is humourous only for being so unbelievable in our day and age – although it’s tinged with the understanding that some people live in environments where his views have traction. However, for every outmoded concept there is a more timeless idea, a thought that reflects back at me through the centuries. These thoughts cover how people should perceive life, their approach to the world, thoughts on what holds humanity back: in many respects this is a philosophical book. What makes it stand out to me is the sense that every moment in life is special and that we should stop focussing on having more, but instead focus on each moment. It is the ephemeral nature of things that makes them wonderful. All things in this phenomenal world are mere illusion. Does mortality wait on our choosing? Death comes upon us more swiftly than fire or flood. … there can be no doubt that it would benefit those below if people in high positions were to cease their luxurious and wasteful ways and instead were kind and tender to the people, and encouraged agriculture. There are many more examples but these are just a few which grabbed my attention. Yes, there is a lot in the book that wouldn’t go down very well at an equalities convention! Nevertheless it reminds me a lot of mindfulness books I have read because of the focus on experiencing the ‘now’, and valuing the world for what it is, not what it could be or has been; not dismissing the imperfect, because it is still of value. In fact, now I’ve written that I think I understand its attractiveness to me: it is a very early version of a mindfulness text, and I am very glad I invested in it! Oh and one final thought – sorry the photo is a bit blurry, I think there’s a fingerprint on the camera lens!